Last week, community members gathered at the Ecology Center to hear updates about revenue from the soda tax, and how that money is being used to support Berkeley’s public school gardening program. The soda tax, which drew in $116,000 from its first month, is projected to add $1.2 million annually to the City’s general fund. The revenue from the soda tax will be spent based on recommendations from an appointed Panel of Experts. In their first weeks, the panel recommended $250,000 be advanced to the school gardening and cooking program, which will allow the program to continue operating for the 2015-2016 school year. The program went through substantial cuts after it lost $1.9 million in federal funding in 2013. As the program gradually rebuilds from those years of lost funding, one goal is to bring back the cooking lessons that strengthened the nutrition education offered to public school students. Read more about the discussion of soda tax revenue and the school program in this article on Berkeleyside. Nay-sayers of the soda tax have tried to spin its implementation as ineffective, because they don’t want similar measures to be adopted elsewhere. The aim of Berkeley’s health and nutrition advocates has always been to play the long game, and to work together as a community to address diet-related diseases. 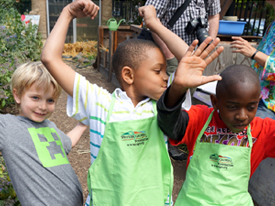 The school gardening program is one important tool for healthier kids that was nearly lost. Now, with the initial wave of the soda tax dollars, the school gardens can keep going in Berkeley for another year, and have a chance to rebuild from years of funding cuts. That’s an outcome we can all cheer for. This entry was posted in Blog, Ecology Center in the News, Featured and tagged Berkeleyside, Garden and Cooking Program, health and nutrition, Measure D, school garden, soda tax by Ecology Center. Bookmark the permalink.